I am not posting so often meaty recipes, but lately, I've fall in love with lamb and its rich texture and tastes, therefore, it was a great experiment to test a couple of delicious spicy matches. As usual, the mixture between sweet and savory is one of my favorite combinations, therefore, expect a lot of unusual matches in this recipe. Unfortunatelly, for various - very serious reasons - I did not keep any picture of the ready meal...As for now, you should believe my genuine words. Rub the lime and the ginger on both side of the meat. It will help to diminish the unpleasant lamb smell which is obvious especially when the meat was deeply frosten before being used. Rub the honey on both sides and the Ras el Hanout spices. In a pan, add the red wine, the walnut oil and the cloves. Heat the oven at 250C. Turn the meat on both sides every 45 minutes. If you want it throughout, it will last at least 2h30 until perfectly ready. As lamb is a bit difficult kind of meat, you better eat it warm, shortly after preparing it. After heating and reheating for a couple of times, the meat will most likely have the texture of a plastic sponge (unfortunatelly). As a side dish, roasted potatoes with rosmarin, plus a fresh tomatoes and cucumber salad will be a very good choice. A glass of red wine with an aromated fruity texture is the best match, with add-on to the wine-soaked meat. The first two months of the year didn't bring too many news and inspiration for my lifestyle and foodie blog. Caught between the high-end priorities of building my business, learning how to deal with various bureaucratic and organisational challenges, while keeping working hard to my ongoing projects. Life and love caught up too, with more -or less - interesting dates, need of re-adjustment and reconsiderations, decisions, decisions and decisions again. With two and half other blogs that require a lot of research, networking and social media maintenance, my hobby blog suffered considerably, with only two posts in the last 60 days. At a certain extent, it reflects the state of the things I am currently doing. I didn't try a new recipe in a long while - with eating out or a frugal lunch were part of my daily schedule. I've seen some interesting interior design and fashion projects, but my mind couldn't stay focused too much. My 'rest and relaxation programme' continued, with some very interesting classes that I've took for full weekends in the last weeks, mostly focused on non-conflict and inter-personal communication, but I was so fast caught back to my other realities that haven't considered (yet) to share my experiences on my blog. I haven't pursued too many collaborations and lifestyle projects because money was always coming from other parts and was relatively unhappy with the lack of reaction of many brands -unless I was overnight growing my audience at over 100,000 followers. All being said, I am pretty well tough. I have a good focus and a long list and ideas and possible collaboration to be developped in the next months. I've happily find my voice as a writer and happily involved in some writing projects that will probably lead to another two new non-fiction books published. I'm glad to be part of various personal and professional support networks of women that are providing valuable insights. Every single day I am becoming a completely new person with a fresh, peaceful and emotionally involved perspective on love, life and relationships. Together with my little boy, I am able to understand the world differently, while learning every single moment what does it mean to be a parent, although only a single one. With a better time management and motivation, hopefully will be able to share more episodes from my daily journey of becoming every single day a better person, for myself and the people around me. Since last December, I decided to give a new chance to online dating. Not that in the last months I was not active searching from one of the ones and onlies - online - but my motivation was anyway quite low, the time for such entertainment limited and I still had - or thought so - a potential relationship in mind that happily didn't work at all in the end. With a lot of positive energy and an open mindset, I not only intensively searched on one online dating site, but even open up a new one, on a very popular website. Breath deep, start swip left and left and left, and once in a while to the right. My friend with a couple of years of online dating apps experiences, told me that many men just swip right in the chance that at least once in a while they will get a match. Me, I swipped left: men with animals, or without pictures or with weird descriptions, or together with a child, or...or...or... (also the one who posted a picture of a bag of gummi bears as his profile suffered of the same fate). Couple of them were matched. Some were actually not even based in my city, although it showed so. I don't want to enter into the reasons they did so, but were far beyond my dating interests. Apparently, while I was offline dating uniteresting and uninterested men, a new online dating trend was launched: Netflix dates. It's like men and women cannot bound over a cup of coffee or tea or whatever beverage, unless there is a movie to watch in the background. No better words that the movie's can describe a connection between people. First date by Netflix? Second date by Netflix? Thank you so much, but maybe you keep searching the right movie lover match. There are also the very direct people - I love being direct myself as well - who are openly asking you for an intimate relationship and even miss you so much although they never saw you - and there is a 100% probability will never see you. Maybe, after all, we are just a slightly advanced version of bonobos, who knows. In between, there are people who are intensively writing for a couple of hours or days and then they disappear, the ones you meet and feel that it is nice to meet again, but actually they have some issues they don't want to share (and personally I am not interested to find out more about), those who are interested to built up only a little harem or to enrich their exotic experiences. However, there are also nice 'matches', with a relatively interesting and lively conversation, that do not make grammar mistakes and even can talk about more than some mediocre film series - which mean a book they've read or some interesting academic discussion. At least once a week I am longing to give up this experience, block and delete most of the people I've meet through my online dating apps and...And what? That's the question that actually keeps me involved as I don't find a clear answer to it. After all, I am back fighting since three months only and as in the case of job searching, the more you are searching and have a mindset open to finding work projects the higher the chances to find what you are looking for. As far as I know I am ready to any kind of business presentation and professional discussion, any time of the day or regardless how tired I am, but when it comes to dating, I can be pretty awkward and bored and lacking any motivation to sound and look interested and interesting at the same time. Therefore, I got the chance to learn something about relationships and how to win -or loose - some of them. When I feel down and disappointed, I just breath deep, do some exercise and think that, after all, 'that's all for good'. Kunstgewerbemuseum Kulturforum Berlin hosts until the 27th of January an exhibition dedicated to fashio, jewerly, mostly created by Christian Dior and Chanel. Bijoux Bjoux! is an interesting journey through the world of high-end fashion starting with the late 1920s onwards. Besides Chanel and Christian Dior, there are featured both fashion and jewelry works by Moschino, YSL or Swarovski. It covers two floors and displays a lot of interesting works that might interest not only the fashionistas, but also the recent times historians as well as people interested in design and fine arts in general. Most of the objects exposed were offered to the public thanks to the generosity of Gisela Wigert, one of the most important German collectors of costume jewelry. Besides jewelry, beautiful outfits, made of fine fabrics looking out of a beautiful fairy tale are the perfect combination to admire and, if lucky enough, to reproduce in real life for a special occasion. For me, the pink dress looks just perfect for any season or special opportunity to shine out in the party world. The jewelry has mostly influences from the 1960s, which is not my favorite fashion inspiration. Big pieces, colourful, overcharged, using different materials and with big - way too big design - are not the kind of things that I love to adorn myself. The conception and the ways in which all those pieces were brought together was, for sure, challenging. Applying fine lines of jewelry on dresses and fashion outfits in general is always a great idea and the good taste rules are telling that this is just enough for going out, without additional jewelry added. Oriental influences in jewelry represent a special chapter and I prefer them often to the relatively simple plain lines of the Western fashion. However, a complex piece of jewerly, usually the case of those inspired by non-European works of art, require a minimal, monocromous dress. The surprise of this exhibition was that this combination of wool and metal is not something new, but a trend that is coming back from - probably - end of the 1970s, beginning of the 1980s. Not my favorite kind of jewelry and earrings in general, but just to be a trend follower, I purchased one (blue) pair recently for myself too. Some of the jewerly exposed are more fine and require a fine and complex expertise to create them.This bracelet, for instance, is one of my favorites, not only for the milky shades of the stones, but also for the delicate touch yet the heaviness of the materials. The massive gablonz from the 1940s, reapearred in the 1970s and are once in a while used also nowadays. I personally prefer the very fine broches, with small - one type of - very precious stones. They are also not something to wear all day long, unless you have a certain age and/or a very high-end social/professional position. All my aunts used to wear broches, but not all of them were my taste. This precious flower caught my eye both for the combination of colour, design and stones. And so are those colourful variants, made by Christian Dior, the last from right being back on the fashion catwalks as soon as the last year. I personally love more the yellow and the pink version, and all the glamorous glittering shoes too. The last section of the exhibition has more interesting pieces of jewerly, suited for my taste and made with attention to small details, using gorgeous precious stones. And there are also some beautiful samples of pearl jewelry, at least some of them the perfect adornment for a special occasion or for Shabbat. Bijoux Bijoux! is a really must-see exhibition in Berlin this month, especially if you are into fashio and design and you are curious to understand current and past fashion trends. An article published in the 10th of December edition of TIME magazine largely confirm my assumptions outlined in my article about How to have a homeworking healthy life experience. Based on various medical studies, it outlines that every single movement we do in our everyday life would significantly help to improve our health condition. However, it should not be anything big and impressive and overwhelmingly intensive. For instance, although you may not need to book a year-long - at least - gym membership, you can at least try to be as much as possible on the move. Like, parking your car a couple of steps away from your entrance will force you take a little bit of more steps. Refusing to take the elevator and walking on the stairs instead. Accepting the challenge of carrying on your groceries as a way to work your arms. Spend your weekends going dancing, which can help you burn up to 300 calories every half hour. Explore the outdoors through gardening, nature walks and bird-watching. The studies are mostly aimed at the American public, in order to encourage them to move as 'every movement count'. Even things like standing on the subway or walking while you talk on the phone - been there, done that - rather than sitting down, can have an impact, according to Jacque Crockford, a certified personal trainer with the American Council on Exercise, quoted in the TIME article (p.22, section WELLNESS). Such activities, known as 'non-exercise activity thermogenesis' - are associated with lower body weight, better over-all health and increased life span. In fact, the sum of every movement you are doing over the day will help you improve your overall health condition and open up new possibilities of improving both your health and increase your life-span. Personally, I am following accordingly such advices, with moving as much as I can either indoors or outdoors. From walking my son to the Kindergarten to taking a movement break from my office chair every half an hour when I am doing home office, carrying my grocery bags and walking at least for one full hour every day, I am trying to take every single opportunity to offer myself a better and healthier life. I am glad I am on the right path and my aim this year is to follow as much as possible such advices for a healthy life. Small steps also count when it comes to feeling and doing better. It's official: with the Jewish holiday of Tu B'Shevat (or the New Year of the Trees) - when it is customary to try a new, eventually exotic fruit - in less than a month, I am looking for interesting fruits to add to an amazing fruit salad I can't wait to share on the blog. Actually, I am open for even two salads, if my testing is going well. For a long time, I wanted to test and taste cherimoya, which is the star of this blog post, one from a longer series dedicated to exotic - at least for the Europeans - fruits. Heart-shaped and as big as a middle-sized grapefruit, cherimoya is originally from Southern Ecuador and Northern Peru. Mark Twain, both a gourmet and a traveller around the world, called it 'deliciousness itself'. The skin and the seeds are not edible. Cutting it is not that easy, as the sking is pretty hard and may present resistance to a less sharper knife. Rich in Vitamin C and B, it has a lemon smell and a milky white pulp. My personal experience with this fruit was not outstanding. All the reviews and food stories I've read kept telling that it tastes as a combination between pineapple, raspberries and strawberries. No trace of it in my fruit. It tasted rather as a (very) green apple. For me, it looks like a great fit in a fruit salad with many very sweet fruits - such as bananas or mangoes, but individually, it did not present for me a special flavour that I would rather leave as the main element in a salad or cocktail in order to build around it with complimentary flavors. It might be that I've been unlucky and found a bad fruit and I would love to keep trying different fruits - eventually, from another country of origin - but until now, I may not consider cherimoya for any further involvement in my foodie plans. 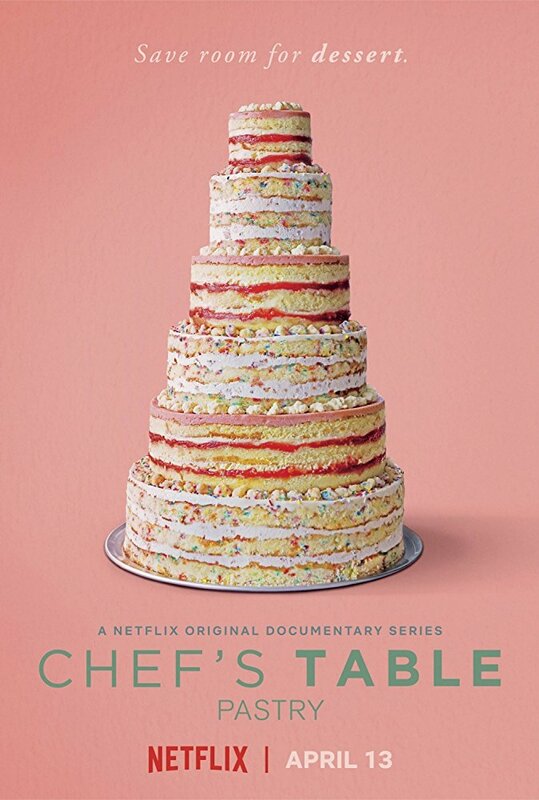 Regardless if you are a foodie or not, Chef's Table that can be watched on Netflix in many installments, interviews famous chefs from around the world telling their stories of resilience, love for authenticity and often the struggle to maintain a cultural identity through preserving old recipes and techniques. Famous food creators and chefs from restaurants all over the world that won not only more than once a Michelin star but also offered a completely different view on food are sharing their stories often in a very relaxed casual environment. But in most cases, their stories are nothing but casual. 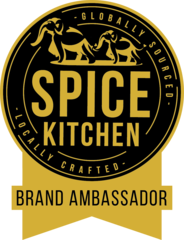 The reports are made from restaurants from all over the world, the main feature followed being represented by the originality of the chef's story and his or her vision on food, very often based on the personal and family culinary experiences and traditions. Besides interesting life stories and inspiring business ideas, there are a lot of outstanding things to learn about restaurant management, new food techniques and the latest trends in terms of food preparation. The return to natural, organic ingredients is part of many of the chefs featured as well. This comprehensive documentary is also a proof of a different mark of times: food and its preparation is becoming more and more part of the mainstream and featuring things happening behind the closed doors of the kitchen is part of the everyday media agenda. Also, featuring chefs - many of them women too - is also a relatively new trend. What I really appreciated and made me follow the stories with the highest interest was the human aspect of the stories, from the personal family struggles to the efforts of getting acknowledgement and spending nights and days passionately looking the right composition. 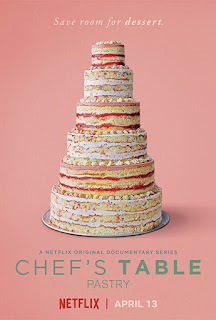 Chef's Table offers very inspiring and tasty visual experiences and would definitely make you consider seeing at least one of those restaurants during the travels around the world. It's make it a good start into the foodie year. Hi, I am Ilana, a self-made chef with tasty imagination and a lot of things to share. From parenting tips to kosher recipes, hobby books and fashion and interior design recommendations, there is always something to share! Follow my tasty journey! I am open to collaborations, both for foodie suggestions - cookbooks and foodie related books included - as well as beauty and fashion. More collaborations will be disclosed soon!